Arriving at Minsmere at c. 08:15, having cadged a lift with my wife who was managing the tea room, I had a couple of hours before I needed to cycle home and meet my son for a driving lesson. As I walked to East Hide, a Sand Martin flew across the North Bank, and once in the hide the usual congregation of large gulls and Black-tailed Godwits as usual took my attention. 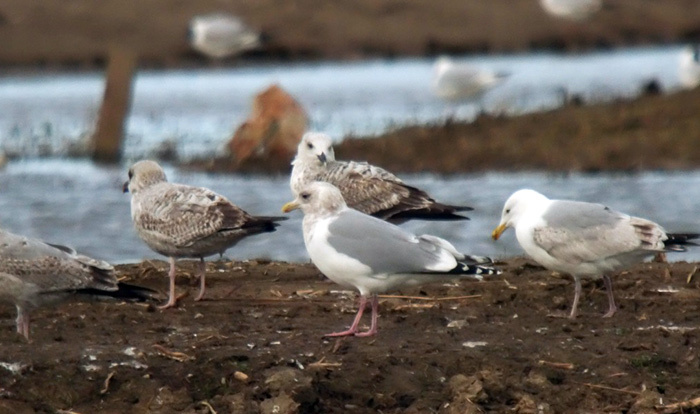 Amongst the gulls, it was nice to see a couple of Caspians (first- and second-winters) and also at least three Yellow-leggeds. It was not long before I found, amongst a group of Great Black-backs and Herring, a strangely distinct, paler mantled gull, with soft and blotchy crescental streaking on the head - creating a vague hood - a dark eye and raspberry pink legs. It was a very distinct gull and was different enough to think, straight away, that it was a northern Pacific-rim gull - although I had never seen adults of these, it somehow seemed familiar. 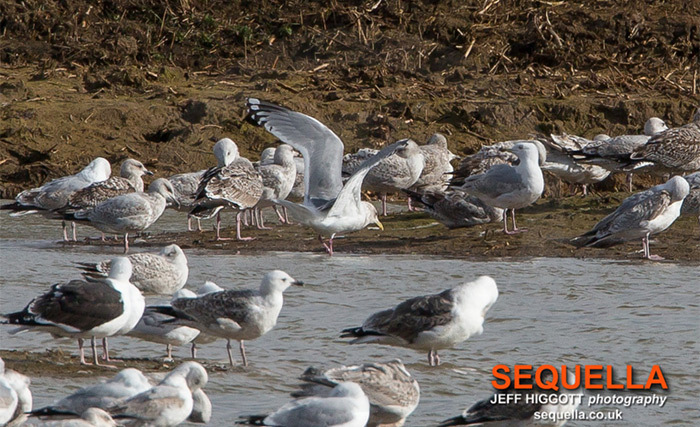 Initially, when on the ground, the size - equal to other Herring Gulls around it, and the rather gawky shape to the head - with a quite rounded crown, gave it a look that both of us said reminded us of the photos of the Vega Gull in Ireland taken by Killian Mullarney (the reason it seemed familiar perhaps). My knowledge of the Pacific rim gulls is largely theoretical, but I knew enough to know this was not an ordinary Herring-type gull. As John and I watched, the one element we had not seen very well was the primary pattern; as it spent most of its time hidden or sat on the ground we did not really get a great view of it for the 90 minutes it sat amongst the other gulls, but the underside of p10 visible on the far wing looked very white. Another thing I picked out was that its right wing looked odd and speculated that p10 might still be growing -very late and a diverting, ‘mis-observation’ as it transpired. I was going to have to leave to meet Ben, so took a few distant photos and videos that I hoped would show the head shape and features, but I was quite concerned about its identity and also that others should see it. 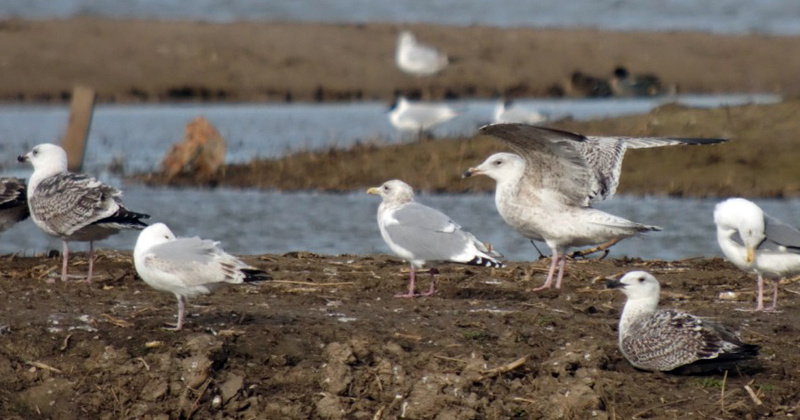 I rang Adam Rowlands, describing to him the obvious features and said I felt it was a Vega-type gull – even perhaps still growing its primaries. However, it was then that Adam suggested Thayer’s Gull. As part of the BBRC review of the Pitsea Thayer’s one of the committee members had brought up that, at times, the two might look very similar (daftly I did not pick up on this until later!). I also let David Fairhurst know, hoping that he might be able to get to see it; with familial duties finally calling I cycled home the bird still nagging me as I went. To cut a long story short, I met Ben to take him out for a driving lesson but with my photos still in the camera (left in my wife’s car at Minsmere), I wanted to check some references on the internet. There was no doubting my first impression that the head shape looked like the images of the Vega Gull in Ireland, though it wasn’t quite the same; one thing was for sure there was too much white in the primaries for it to be Vega. I then looked at the photos of the Irish and Spanish Thayer’s on Birding Frontiers and… well the penny dropped in an expletive-ridden manner. By now it was late morning and David Fairhurst had finally succumbed to temptation and was watching the bird when I rang him. We discussed that the plumage looked spot on for Thayer’s but, like me, I think Dave was a little concerned about its size and head shape. By now I think David felt we had better put it out as something - I am not a fan of ‘possible’ or ‘probable’ species, so he texted it to Suffolk BINS as a gull showing the characters of Vega Gull. Almost instantaneously, however, we had realised it was more likely a Thayer’s. He had seen (and videoed) it in flight and we went through the primary pattern over the phone and so I then texted to BINS that it showed more characters of a Thayer’s Gull. Finally I took Ben out for a drive and somehow (strangely) we ended up at Minsmere. Gathering my gear from Janet’s car, we walked to West Hide, from which, looking into the light, you could see the bird (asleep or hidden!) but viewing was not ideal. After “flat-batting” a bit of questioning by those present, suddenly it took flight and WOW! What had seemed quite a large gull on the ground seemed neat and compact and smaller in flight; more importantly the general wing pattern seemed great for thayeri.. Superb! There was a lot of excitement at that point and I got a text from Adam who had seen it do the same flight; he confirmed (with a few choice words) our impression of it being Thayer’s, though there was still a little caution as we had yet to see a good photo that showed the precise wing pattern. Walking round to South Hide you could see the bird from the path, though hidden; from the hide it was head on. I was mentally kicking myself that I had not sorted it out earlier, but now that I was more confident in what it was it somehow seemed a lot easier. With some excellent and sharper photos of the primary pattern taken by Craig Fulcher and Jeff Higgott, you could finally see the exact pattern on the wings and (like Adam) felt it was absolutely spot on for Thayer’s. All of the features fell into place: the dark eye giving a quite gentle feel to the face; the pale creamy yellow base to the bill; the smudgy and ochre-brown head markings; the raspberry legs; and, most importantly, the wing pattern. What a day! 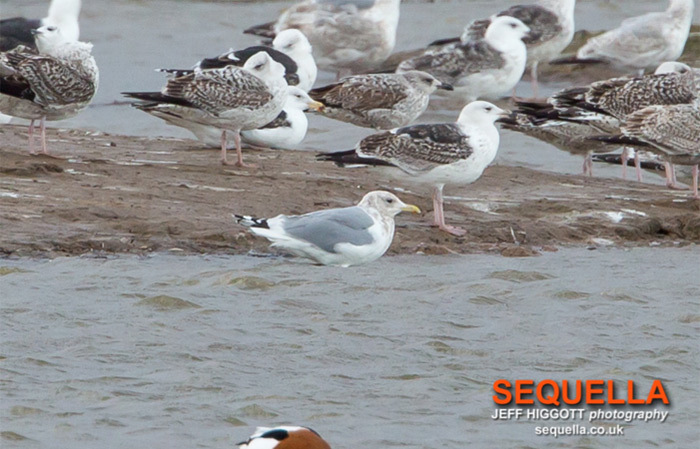 A bit fraught with having to leave it in the morning, and my initial sway towards Vega: I simply had not expected how much alike Thayer’s and Vega Gulls might be- a fact that did not help in my prevarications over the gull’s identification. With additional thanks to Jeff Higgott for his additional photos of the bird.